I just got back from a week on the French Riviera. Sounds nice, doesn’t it? Well, it was and it wasn’t. I can report many good things about the trip, but there was too much walking and climbing for my poor old knees, and our lodging left a lot to be desired. I’m going to make multiple posts on the trip. I’ll start off with our hotel, which had pluses and minuses. I went with the Photographic Society of Orange County, a great group of photographers. They take an international trip every year; this was my first overseas trip with them. We had nearly 30 people in our group, but everyone split up and went their own way once we arrived. 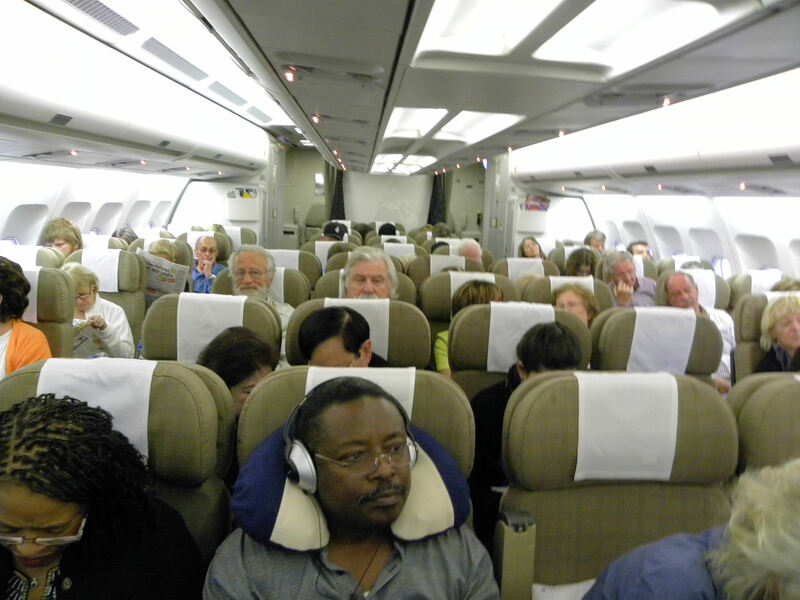 The travel agency booked us on Swiss Air, a great airline. Although we were packed in coach seating like sardines, we got free wine, good food and Swiss chocolate. I grabbed this shot by holding my camera over my head and shooting behind me. Jerry and Dedra, right behind me, were in our group. 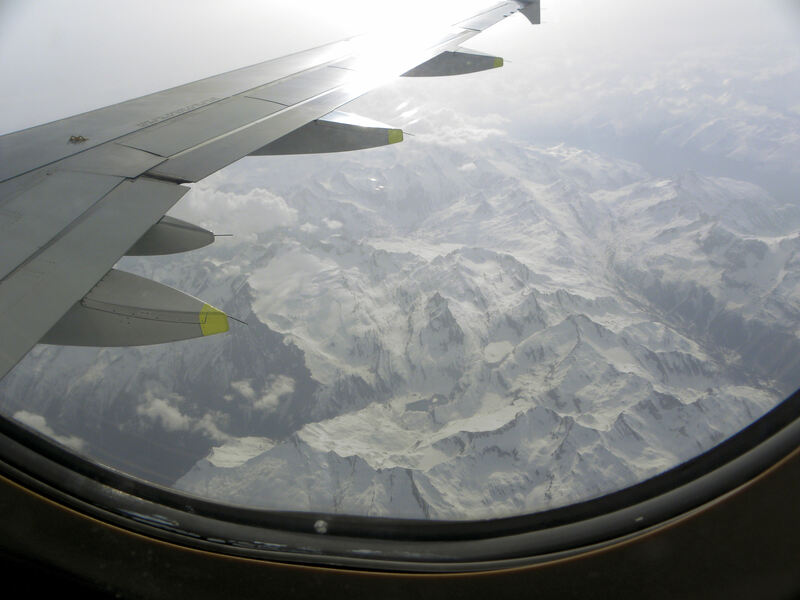 This was my first trip to Europe, and I was thrilled to see the Swiss Alps, even from the air. The signage for the hotel at street level was computer printouts sheathed in plastic and taped to the hotel front. 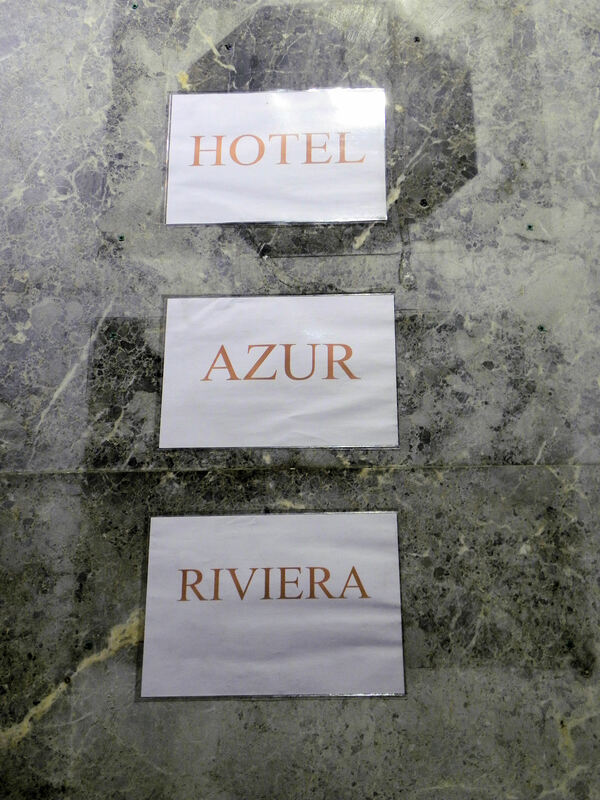 The lobby of the Hotel Azur Riviera had nice marble on the floor, a remnant of what must have been its former glory days. Fabien was one of the desk staff. 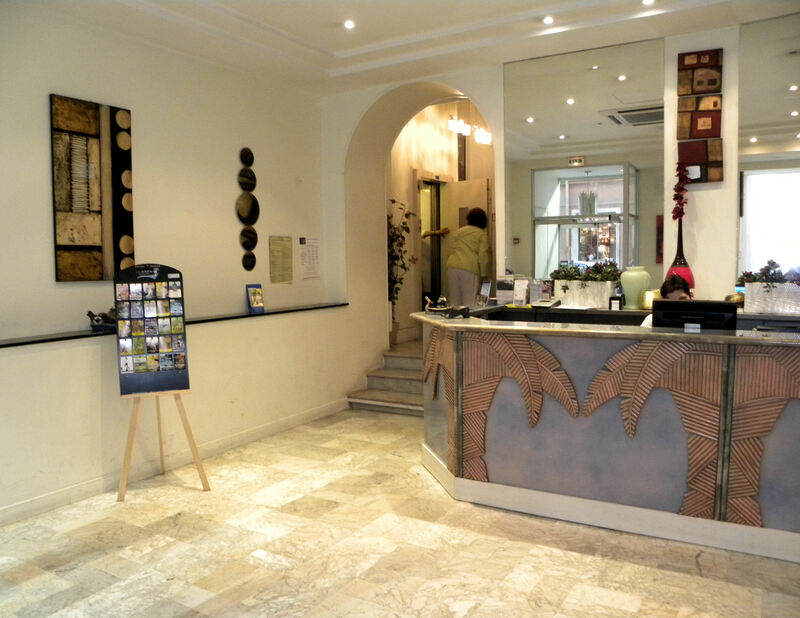 I must say, the staff was excellent, especially Fabien and Jacques, who helped me get my new iPod set up and connected to the free hotel WiFi. 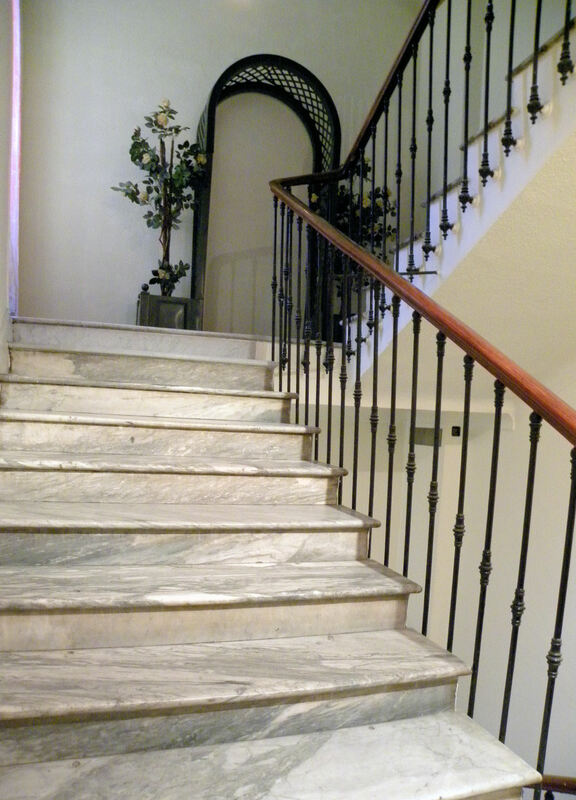 The marble staircase was quite attractive, but I have bad knees and needed to use the elevator. The tiny hotel elevator only held one person with luggage, or a maximum of three people packed in. 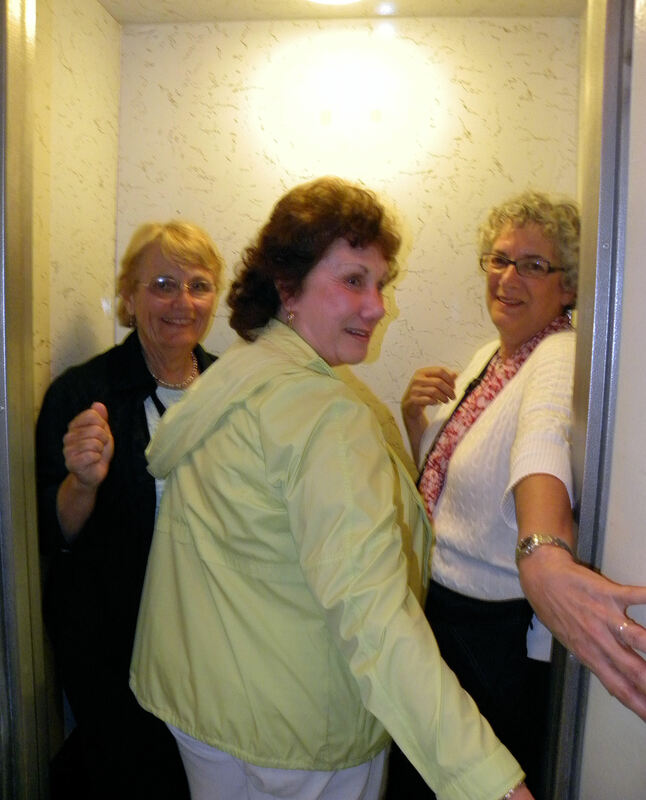 Here Carole, Carol, and Marianne cram in for a ride to their rooms on the 5th floor. The elevator broke on our first full day there, stranding two members of our group inside. The staff had the elevator fixed within 36 hours. I stayed in Room 410. The rooms were small and stark. Two out of three lights in my room did not work, nor did the phone. The bed was comfortable. 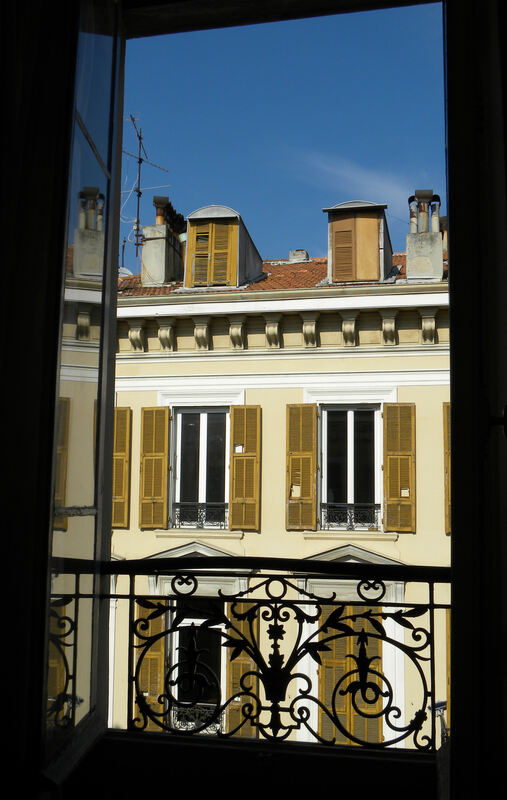 Small rooms, sparingly furnished, were situated on a VERY noisy street. The tile in my bathroom was attractive, and the fixtures were in good shape. 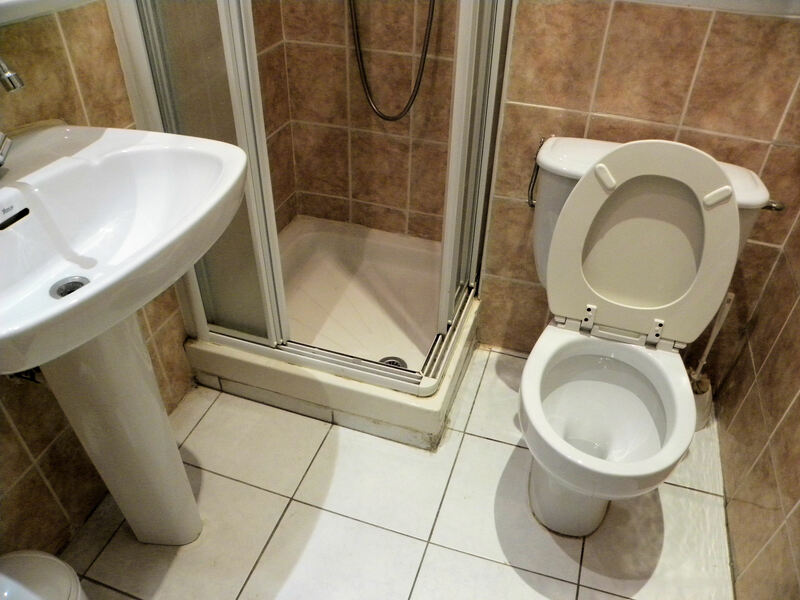 The shower was tiny, like one in a motor home, less than 2 ft square. Soap and shampoo were not provided, but were available by asking at the front desk. I brought my own, not being sure if they were furnished. I didn't see screens anywhere. If you opened the windows to get some fresh air, bugs came in. One lady in our group was bitten by something in her room, probably a spider, and had to go to the hospital. 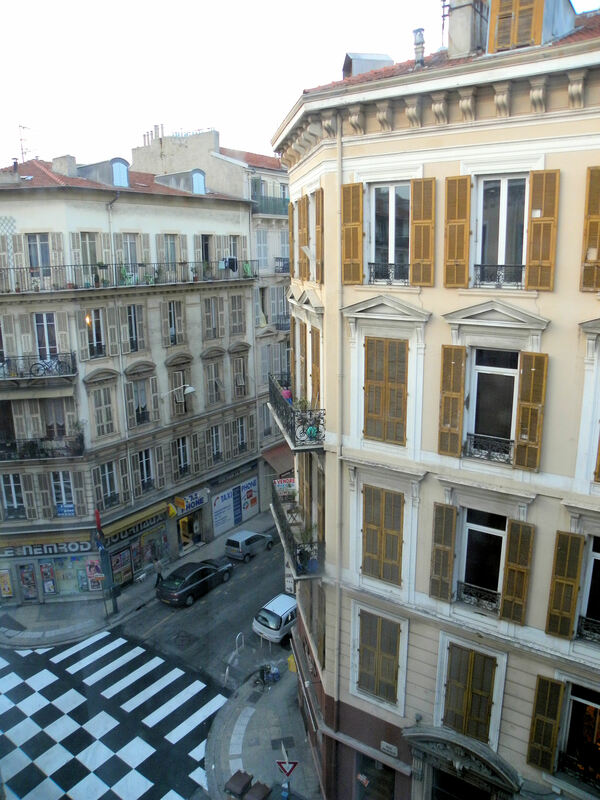 This is the view out my window, leaning out to snap it. View out my window looking the other direction. The neighborhood looked like a cross between the French quarter in New Orleans and New York City. Constant street noise. The video is just people and traffic below my room, but you can get an idea of the noise level. Too bad I didn’t get the sirens in this video. Wee-ooo-wee-ooo. 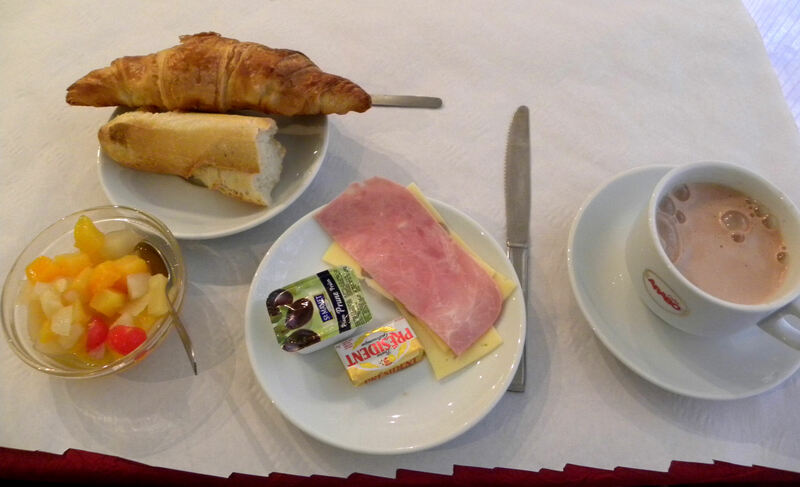 Breakfast was included, and I thought that it was great. 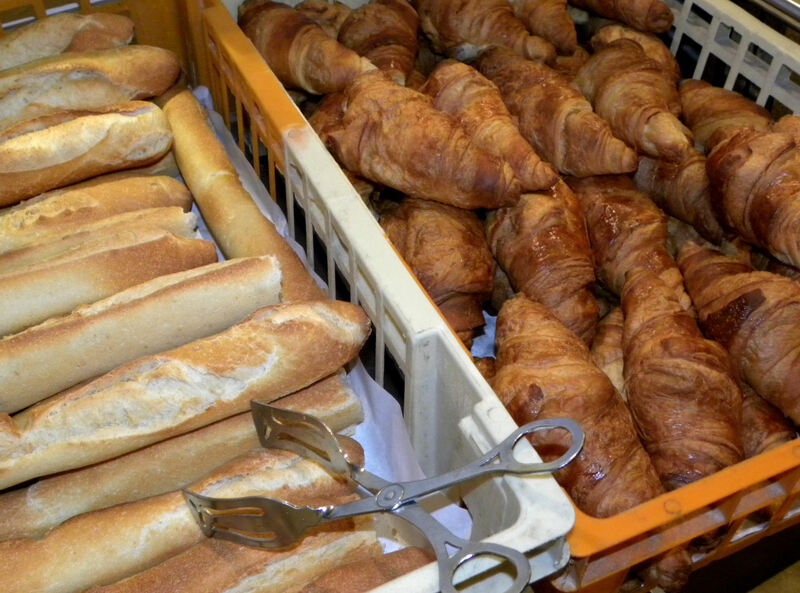 We had fresh baguettes and croissants every morning. 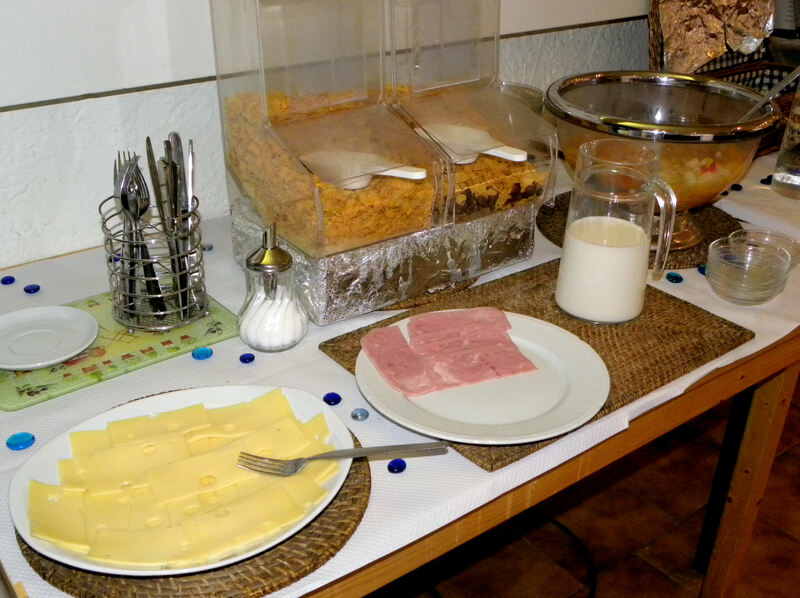 We had cold ham and cheese, canned fruit cocktail, cereal, orange juice and a coffe machine that had a choice of cafe, cafe au lait, cappucino, or cocoa. No decaf, so I drank cocoa. We had the same breakfast every morning. Sometimes we had boiled eggs as well. To avoid going back up on the tiny elevator, I looked for a toilette on the ground floor. This is what I found. I didn't have the courage to go any farther. 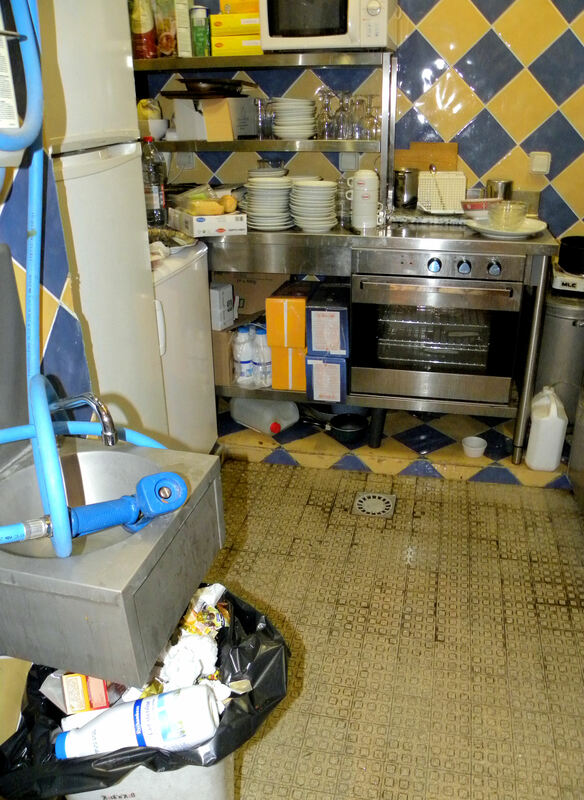 This is the tiny kitchen where the desk guys prepared our breakfast. They didn't have a separate kitchen staff. Fabien did a great job of arranging the baguettes and croissants on the table. When he wasn't on duty, the cocoa was too weak to drink. 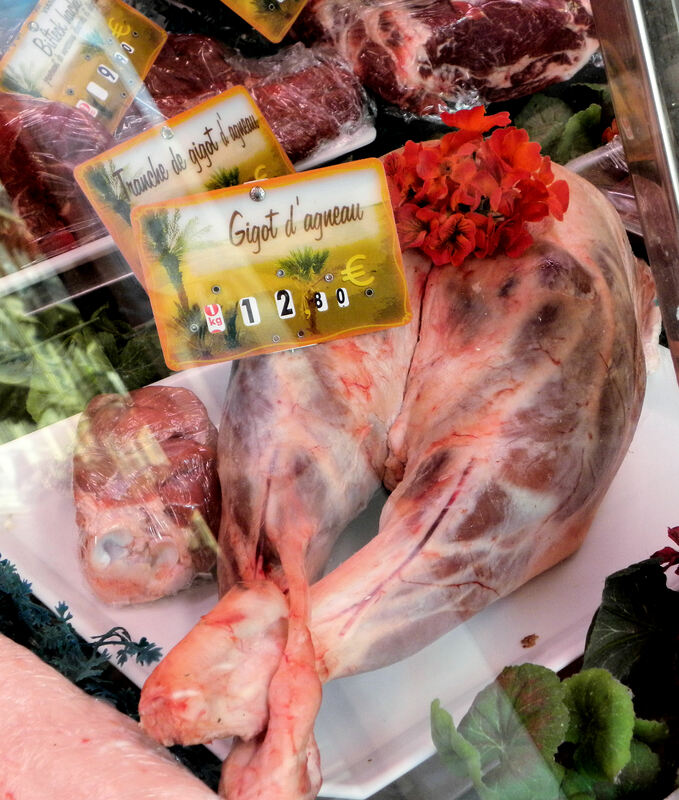 There was an open air butcher shop next to the hotel lobby, part of our building. The butcher roasted chickens on a rotisserie outside the shop and it smelled GREAT. I had never seen leg of lamb presented in quite this manner. 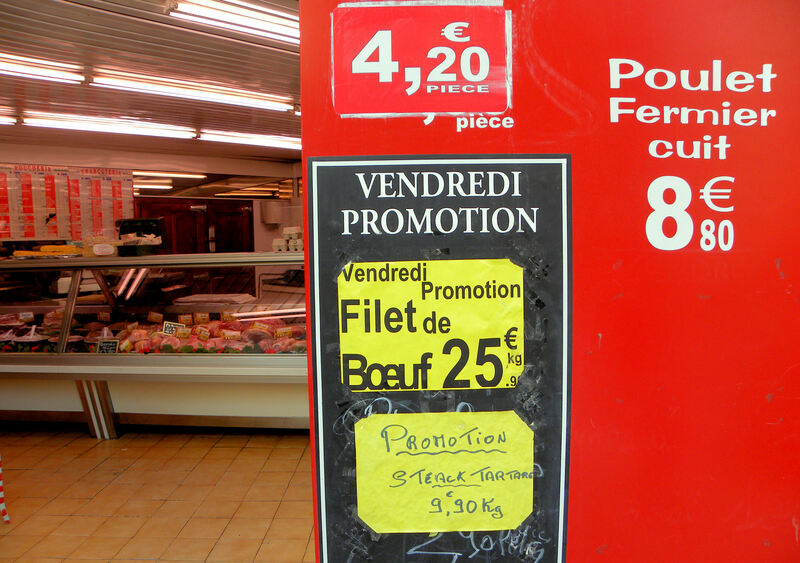 The butcher worked on this large piece of meat to cut it into smaller portions. I’ve tried to present a balanced view of the hotel, at least my experience with it. Other people in our group experienced problems other than the ones I had, like no shower curtains in their in-tub showers, showers with leaky hoses that sprayed all over, no towels, etc. All in all, the hotel wasn’t terrible. 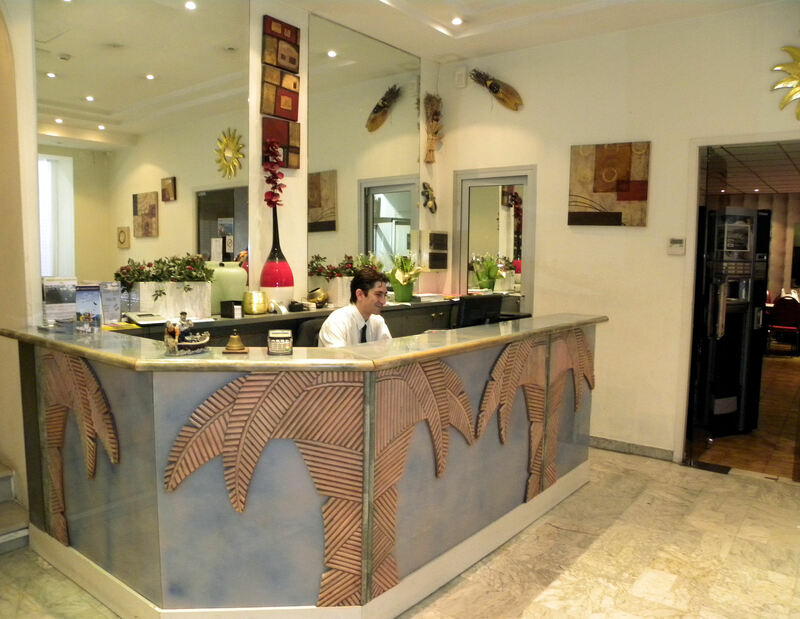 It was convenient to the train station and bus stops, with many good restaurants nearby. It would be good for students perhaps, or those who are on a tight budget. It just didn’t suit our group of mainly senior citizens, and one tiny elevator was no good for a large group checking in. 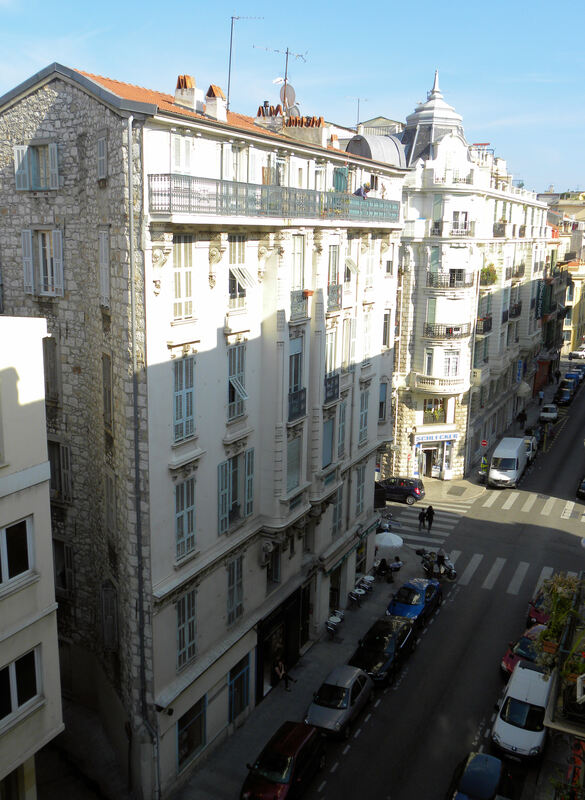 The place was too noisy for me, but most of the hotels seemed to be in similar locations, right on the street, and older. If you stay there, bring your own soap! 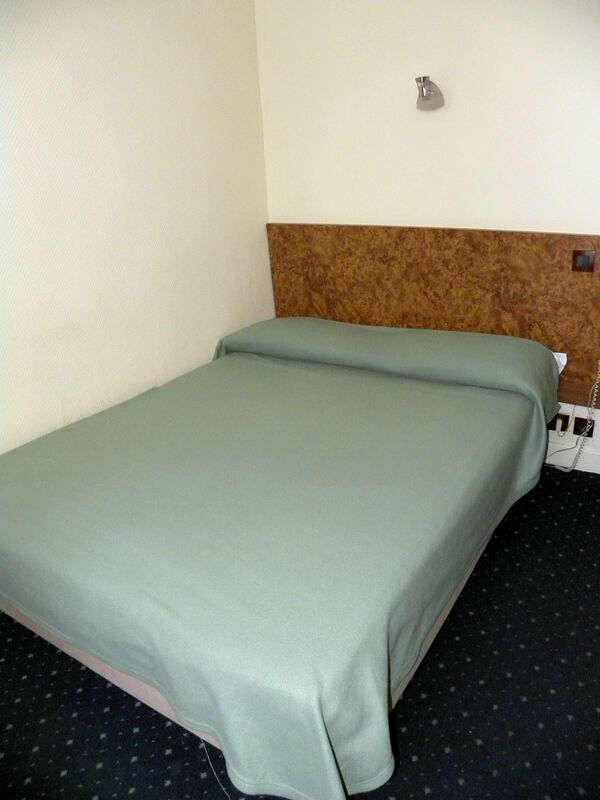 This entry was posted in Uncategorized and tagged Comfort Hotel Azur Riviera, France, French Riviera, Nice, Photographic Society of Orange County, photos, video. Bookmark the permalink. Hi Kathy, I guess my unhappiness stemmed mainly from expecting something different. Live and learn. I have learned to go in with no expectations. Just for this reason. We, as Americans, I believe tend to expect a little more then the rest of the world. I know, Turling, we’re spoiled. Apparently only the nicer hotels in France provide soap. I think it was the noise that bothered me the most. I was expecting the French countryside of Provence, not a big city. I couldn’t help, I had to google this hotel. It is a 2 star hotel. I don’t believe that it is the issue, as Turling says, you expect more (as I would expect to have soap in the room, and a proper kitchen in a hotel). It’s that this is 2 star hotel. Motels usually get 1 star, so this is slightly better than a motel. I wish you more luck next time, and ask about how many stars hotel has, don’t go below 3 stars anywhere is Europe. 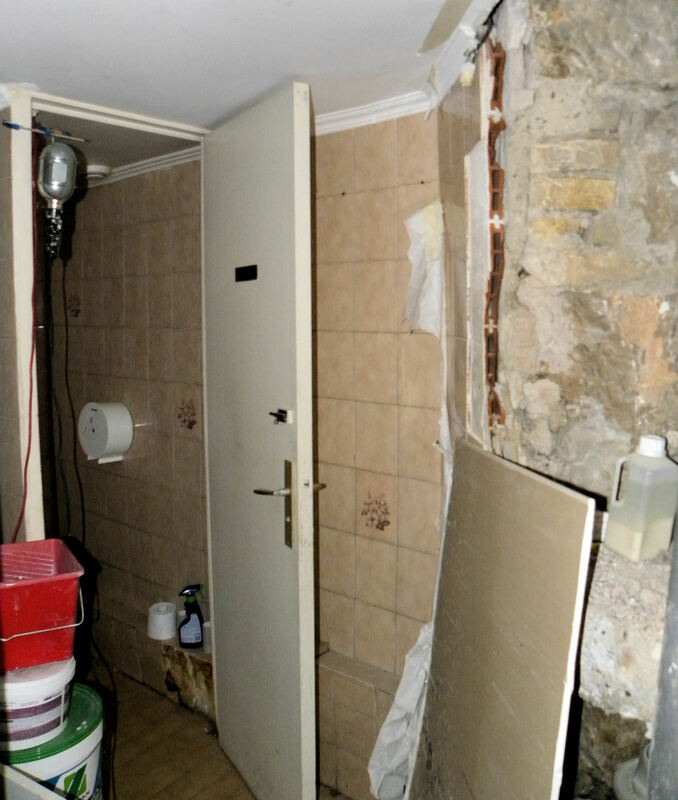 Thanks, Vrtlaricaana, we were aware that it was a 2-star hotel and had bad reviews. 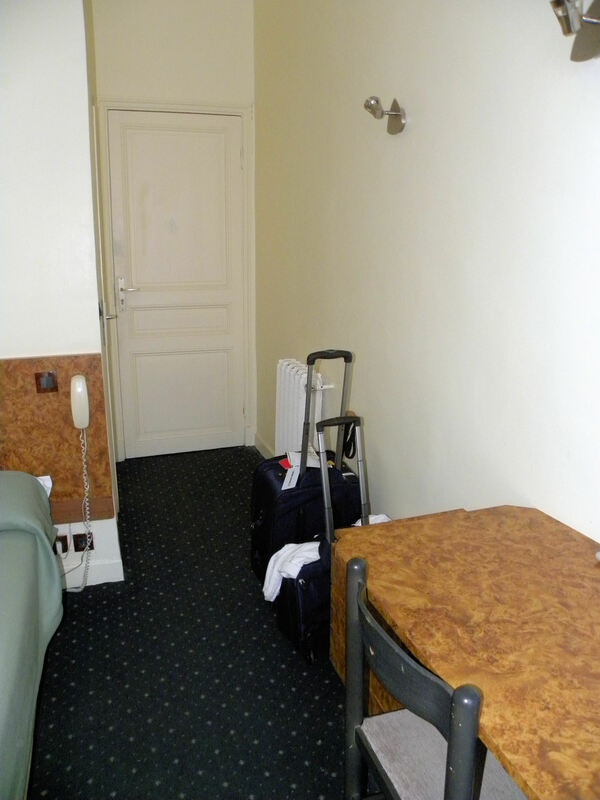 We had warned our trip leader, but he didn’t want to upgrade hotels because of the cost. We were stuck, having prepaid before we knew where we were staying. I don’t like staying at 2-star motels in the states either. I don’t need 5-stars, can’t afford them or even 4-stars ones generally, but 3-stars suit me just fine.